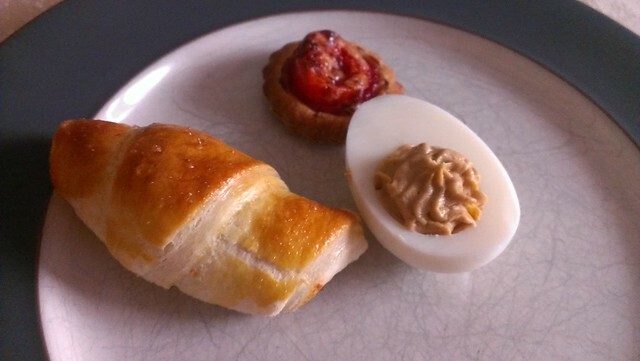 We’re taking finger food to a Eurovision party this year, so I have made devilled eggs and puff-pastry pack two ways. Devilled egg recipe here. Glut of teeny eggs from newly laying small hens, so used them up in this. Quite faffy, hard to transport and not the sort of fiddly work my clumsy fingers are any good at. I should probably stop even trying anything with piping in it. Then a block of all butter puff pastry is divided – this time I did 1/3rd tartlets 2/3rds croissants. Roll the pastry, cut rounds. Halve cherry tomatoes and optionally pre-roast them a little in the preheating oven. 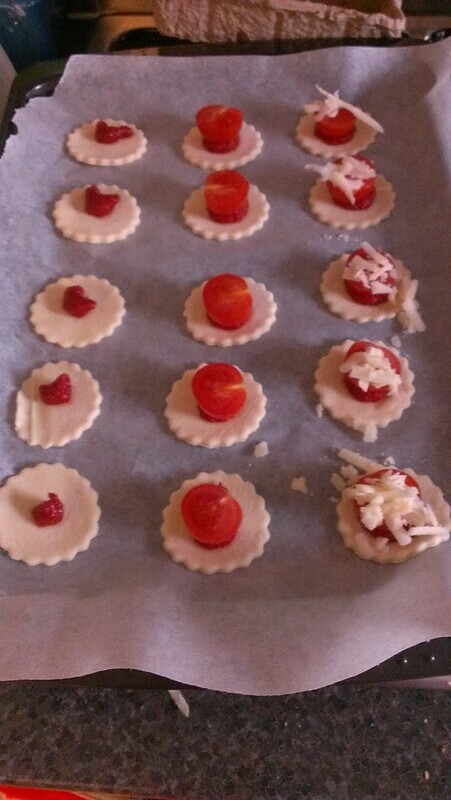 Stick each tomato half to a pastry round with tomato purée and top with a sprinkling of grated parmesan. Bake until crispy, about 10 minutes. Roll the remaining pastry and cut into triangles, either from a large circle of rolled pastry, or less wastefully from rectangles. You are looking for very tall isosceles triangles. 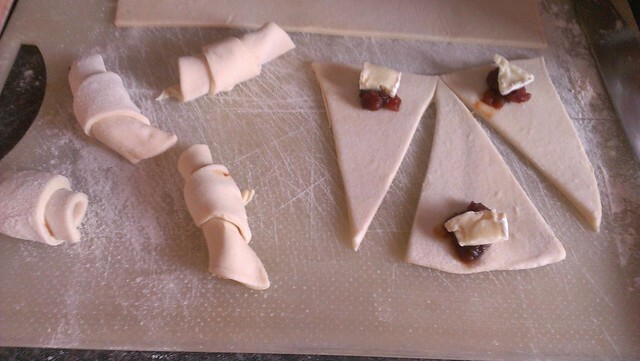 Place a small piece of cheese (camembert, goats, etc) and half a spoon of interesting chutney (I’m using something from the Garlic Farm) on the wider part and roll them up to form a croissant. Brush with beaten egg and bake for 10-15 minutes until golden. Serve with Meg Pickard’s Eurovision Bingo cards [PDF] . We’re just moving into a food topic with Y8 at the minute and with my five classes last year and four this year, it’s now something I’ve had a bit of practice in. My first lesson is about breakfast food and opinions, so it starts with a textbook vocab list and pictures – students have to match the target language words with the pictures and then write a vocab list in their books. Then I get them to generate English words to fit the sentences “I like bread because it’s _____” and “I don’t like cheese because it’s _____” and they go off to the dictionaries to find the words they need. They need to be able write sentences like this – opinions and reasons – to get through level 4 in the National Curriculum for modern foreign languages and do well in their end of term exams. I like doing it this way because it means each different class has a slightly different word bank and when I’m marking 250 versions of the same thing there is enough variety to keep it interesting for me. This year’s students have all wanted to know the word “bland” which caught me a bit on the hop. Happily our native speaker teaching assistant could tell me the French is “fade” without me having to resort to Wordreference.com. I didn’t know that word as a 12-year-old, but learned it a little later on at a very memorable family dinner. It turns out they have all learned it in food technology, so it’s nice to have a bit of cross-curricular working. I’m currently avoiding marking a set of books where some of the words they went for were mouldy, divine, and rank, so I am getting sentences like j’adore les croissants, parce qu’ils sont divins, and je déteste le fromage parce que c’est nauséabond. A little later on to get them using connectives more creatively, and get them practising future and past tenses for levels 5 and 6, I will be getting them to do these Barry-Smith-style sheets which I have put on the TES.